This post is a bit different from my usual – and rather longer – so you might want to pour yourself a beer and find a sausage to chew on while you work your way through this tale. It’s certainly a tall tale, but also true…. I enjoy being in the hills and I also like a bit of solitude, so during a recent holiday from the paying job I was looking forward to a few days tramping. For regular readers of the blog, you may have read previous posts about my time tramping in the hills. I always take along a few snarlers to keep me in good spirits – however my tramping excursion during April had very different outcome. I planned for a solo four day tramping trip. I left the Holdsworth road end in the Tararuas and headed to Mitre Flats. For breakfast the following day I had slices of a smoked chorizo from The Fridge in New Plymouth. This was an enjoyable sausage that has a strong flavour, the smoke adds to the very pleasant complexity of the sausage while the after taste has strong element of heat. All in all, it was a great aperitif to a day’s tramping in the hills. From Mitre Flats hut I climbed up over Mitre Peak. The weather was good for going over the tops, just a little bit of cloud and a gentle breeze. The descent from Mitre Peak was steep and was more like rock climbing. I was heading to Tarn Ridge Hut. I went over the peaks of Brockett and Girdlestone and was less than half an hour away from the hut. There were a few tricky pieces to the route with steep slopes off either side of the ridge. I had spotted a few challenging bits coming up but did not consider that I was traversing a gnarly section of the track. Then calamity struck. I have no idea what preceded my tumble, however I was conscious as I somersaulted down a reasonably precipitous slope. I fell for approximately forty or fifty metres. The picture below shows the slope I fell down, my red pack is visible if you zoom in on the image about 80% of the way down. The police did not want an abandoned pack to be left visible from the track so they sent a helicopter to retrieve this the following day and they took the photos. The pilot of helicopter who picked the pack up said to my wife, “I don’t know why he stopped tumbling? He could have easily fallen for another couple of hundred metres.” I knew the terrain was rugged, however this puts another perspective on it. When I stopped tumbling I looked at my right leg and realised that the extreme angle of my boot in relation to my leg meant that it was stuffed. I was able to diagnose a compound fracture of my lower right leg just by looking at it. Fortunately the puttees (or gaiters) on my boots meant that I could not see the exposed bones, however I could see the blood coming down the side of my boot. I was also a little sore so I set off my emergency locator beacon and also put on extra layers of clothing. I had lost the beanie I was wearing in the fall, but had a balaclava in my pack that I used to keep my head warm. After 40 minutes or so a helicopter came looking for me. After some searching it located me, but then to my dismay it departed. 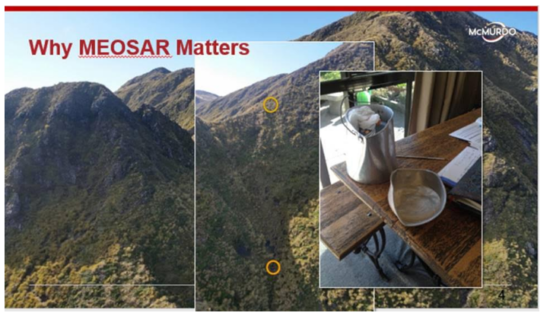 When I had set off the beacon I also checked my cell phone as I was aware from experience that many ridges in the Tararuas get cell phone reception. I had received a text, but did not have coverage. So after the helicopter left I made the decision that the best way for me to be rescued was for me to act – I could not just rely on others. I decided to crawl up the slope. This meant abandoning a stash of quality sausages I had taken with me for my four day trip. 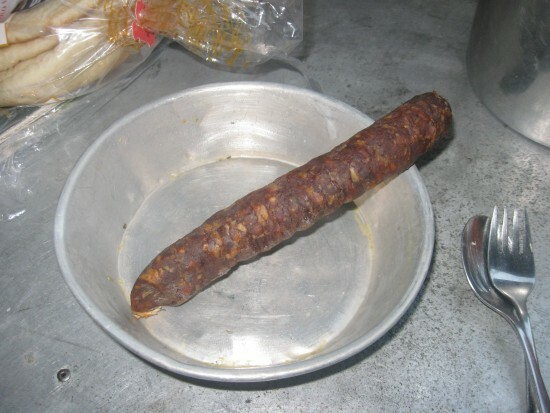 As well as The Fridge’s smoked chorizo, I also had chorizo criollo and Dutch braadwurst. When facing adversity my preservation was of greater importance than the quality sausage stash and they were left with my pack. Does this abandonment of the snarlers mean I am removed from the ancient order of sausage aficionados? I could put weight on my knees. The slope was covered by tussock, snow grass, and loose rock. As I crawled upwards I was aware when the floppy lower leg was not supported by the ground and it did hurt. I also had to roll over a couple of times. To do this I placed a hand on each side of my knee and then moved the stuffed leg over the good leg. The flaccid foot would not go over my left boot. To achieve this feat I had to manipulate the lower leg with my left boot. Rolling over was a very challenging manoeuvre that gave you a greater appreciation of relative pain levels. When I do longer mountain runs and I am a bit tired and the legs do not go as fast as I would desire, I concentrate on my breathing. This moves my focus to maintaining a good rate of breathing and distracts the mind from the pain or struggle of the event. I used this technique when I crawled up the slope. By focusing on my breathing I was able to be minimise the pain, and focus my mind on a positive aspect of my body. After some time (and considerable effort) I reached a point where the slope became too steep and I could not crawl any higher. Luckily from this point I was able to get cell phone reception so I called the police. They informed me the helicopter had gone to be refueled. The police wanted me to stay on the phone, but I informed then that my battery was low and I needed to hang up. I had no bars of battery. I think the temperature was about five degrees and the cold wasn’t helping the battery, so after I ended the call I put the cell phone into my crotch. The helicopter returned but the cloud was coming and going. There was increasing cloud cover, and the wind was growing in strength. The chopper circled and also looked at me from the same height. However it did not get within a hundred metres of me as I lay on the slope and then it departed. Bugger, I thought. It was nearing dusk and I was psychologically preparing for a cold night in the open on the exposed tops. I was positive that I would make it through the night. The crewman on the ground told me to climb into the back of chopper, it was hovering very close to the steep slope. At the that stage I thought that both legs were stuffed, One was broken and the other one felt like it had been whacked in the number of places with a hammer, it was really sore. I doubted whether I could stand. I said to him, “I can’t do that.” His response was, “Do you want to get out of here?” So I put my semi-good, least bad, left leg on the skid of the hovering helicopter and felt straps on the inside, I used these to haul myself into the rear of the chopper. This involved another rolling over move, I did this one, quickly and with no support of the broken lower leg. The crewman then climbed into the cramped back of the small helicopter. His legs were resting on top of my mine. For me this was very painful. I had headphones on and could converse with the crew. I was very grateful to be in the chopper. I asked if we could reposition ourselves, the response was, “No, not while we are flying.” I was in pain, however the options were: intense pain in a helicopter, versus, less intense pain on the side of the hill, I was content to take the temporary pain and discomfort of the flight to Carterton. It was probably took less than ten minutes to fly to Amalgamated Helicopter’s base. When the ambulance eventually arrived at the base, I was transferred from the back of the helicopter into the back of the ambulance. While one medic put an IV into my arm, the other took off my puttees, boot and sock. I asked if there was exposed bone, The other medic said, “Yes.” On hearing this, the crew of helicopter come to view the leg. While I did not want to see the injury, I am sure the audience appreciated the internal view of my limb. The morphine did not kick in until we were on our way to Masteron hospital. I had abandoned quality sausages but I was alive. The press picked up on my escapade and here are links to a couple of stories. 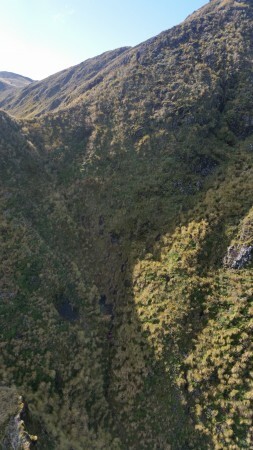 The key element is the quality of the crew from Amalgamated Helicopters of the Wairarapa. The pilot and the man on the ground did an outstanding job in trying conditions. Without the locator beacon I would be dead. And so ends this little adventure. As I write this three weeks after the tumble I been thinking about where I will go and the routes I will follow (along with the sausages I will take!) next time I head into the hills. Addenda: And what became of the snarlers? The police returned my pack while I was in Masterton hospital. My wife gave all the remaining food to a friend who lives locally. She keeps chooks and they had a diet of food for the hills. I wonder if the eggs had a piquant of chorizo flavour? The billy and plate I use in the hills suffered during the tumble, while they can be beaten back into shape, it will take a longer time to repair my body. But as the Bard says, all’s well that ends well. 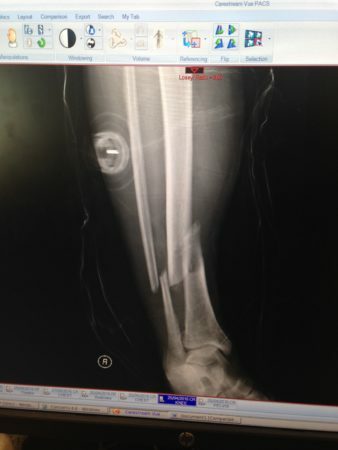 And for those who want more – three months after the escapade I asked to see the x-rays. 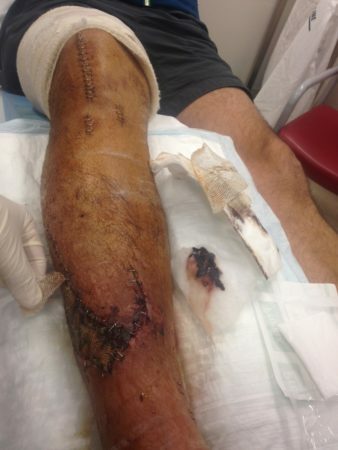 Here is one of them, when I viewed this I understood why I could self-diagnose the broken tibia and filbula. My medical notes said when I arrived at Masterton Hospital the tibia was exposed and there was a 6cm by 5cm hole. The consultant said to me that they regard 2cm by 2cm as a big hole. I have never been one to do things by halves. And when they took the bandages off the leg for the first time, you could see the damage done, there were 55 staples in the leg. You can understand why I have significant scarring on my lower leg. And there is still more: In May 2017 Amalgamated Helicopters won an award for this rescue, here is a link to the story. And I was the first person in the world to be saved using the MEOSAR satellite network – read about this here. McMurdo who make the locator beacon that I used made this slide for a presentation. The yellow circles indicate where I fell. They tell me the slide provokes many questions from the audience…. And Wilderness Magazine wrote an aptly named article titled Beacon and Sausages. The leg did not heal as I would have liked. Ongoing infections meant being readmitted to hospital. I ended up with seven surgeries on the leg. In one surgery the plastic surgeon gave me four options, option four was amputation. I was pleased to come out of the anesthetic and see the leg was still attached. After seven surgeries, it appears that I am recovering normal function back in the leg. I do have a a few holes in the muscle where you can poke your finger into the leg, and some large scars. The key point is: it still works. In June 2018, I walked a marathon in under 6 hours. The hills are beckoning…. In October 2018, my wife won an award for best contemporary quilt at a quilting exhibition. Called Survival Instincts, it tells the story of my escapade and recovery. When I came home from hospital it was 99 days before I returned to work, each day she used to do a stitching circle. Also recorded are the hospitals I went to and the associated surgeries, procedures and more. You can read about this here. More importantly, though, did the Police eat your sausages after they retrieved your pack? Great read Don! Where do you get emergency locator beacons?! You can buy them from any outdoor shop. I got mine from Bivouac. 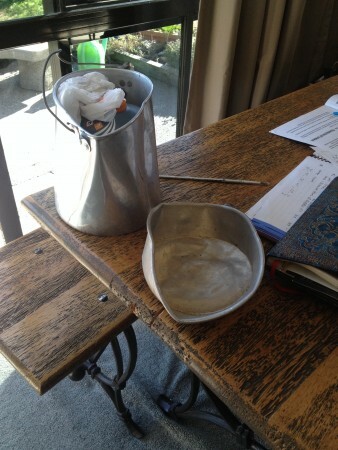 I had just recently heard about your Tararua adventure and misadventure – by now you will be on the mend, however it would have been painful – and cramped your style for a while! Good on you for staying calm. Hope you are both well, Chris and I are now living in Kapiti Coast, I’m still at KO but working on my next career – which will be living frugally – probably – and painting landscapes etc. We’ll see what happens. Anyhow take care and stop throwing yourself off steep hills.